Oil rallied on worries U.S. sanctions on Iran will hurt global oil supplies, and gasoline rose as a series of hurricanes and storms headed toward the U.S. or Gulf of Mexico. Hurricane Florence was a Category 4 hurricane barreling toward the Carolinas, but it is not as likely to impact oil and gas directly. An as-yet-unnamed storm, likely to develop into a tropical depression, and Tropical Storm Isaac could both potentially head into the Gulf of Mexico, where oil production and refinery facilities are located. Strategists say it appears more likely the administration will succeed in taking large supplies of Iranian oil from the market, as South Korea and Japan indicated they would no longer buy it. Oil rallied on concerns U.S. sanctions on Iran could hurt global supply, while gasoline rose as traders watched multiple storms approaching U.S. shores and the Gulf of Mexico. Hurricane Florence, a Category 4 hurricane, barreled toward the Carolinas Tuesday. But other smaller storms, such as Tropical Storm Isaac, are potentially more worrisome for the oil and gas industry, because they have the chance of moving into the Gulf of Mexico, where there are energy production and refining operations. Gasoline prices also rose on concerns about issues at the Phillips 66 Bayway refinery, affected by a power outage and flooding in New Jersey. Crude, however, was more affected by signs President Donald Trump's sanctions on Iranian oil may succeed in removing a large amount of Iran's exports from the market once they take effect in November. "It looks like South Korea and Japan are going to zero purchases. That's in line with the administration's demands," said John Kilduff, partner with Again Capital. "Both those countries stepped up to buy more U.S. crude oil." West Texas Intermediate crude oil futures for October jumped 2.5 percent to $69.25 per barrel, while Brent crude surged 2.2 percent to $79.10. RBOB gasoline futures for October delivery jumped 2.2 percent to $2.00 per barrel. "The market is getting concerned that those sanctions will be very effective in taking Iranian oil off the market, at the same time wondering if there are going to be other outages in Venezuela, Libya and can other producers make up supplies," said Andrew Lipow, president of Lipow Oil Associates. As for gasoline prices, Lipow said there should not be much impact from Florence on gasoline unless it creates flooding or power outages that impact pumping stations for the Colonial Pipeline, which runs through the Carolinas and carries gasoline to the Northeast. Platt's said that when Hurricane Irene came close in 2011, Colonial Pipeline made tentative plans to shut down but didn't have to — but that this storm looks worse. Platt's said Colonial issued a statement to shippers Monday, saying it was preparing for potential impacts later this week. "Gasoline is getting helped by a couple of things. You get a sugar rush of demand when you get massive evacuations. The problem is you borrow from demand today from next Thursday when you have no demand. Hurricanes are demand destroyers," said Tom Kloza, global head of energy analysis at Oil Price Information Service. "I think people are worried there are so many areas at risk of flooding that are contiguous to the Colonial pipeline." Strategists said Tropical Storm Isaac could have more impact on energy prices than Florence, if it runs across Mexican oil operations in the Yucatan or even heads north into the Gulf of Mexico. The storm was passing through the southern Caribbean Tuesday. 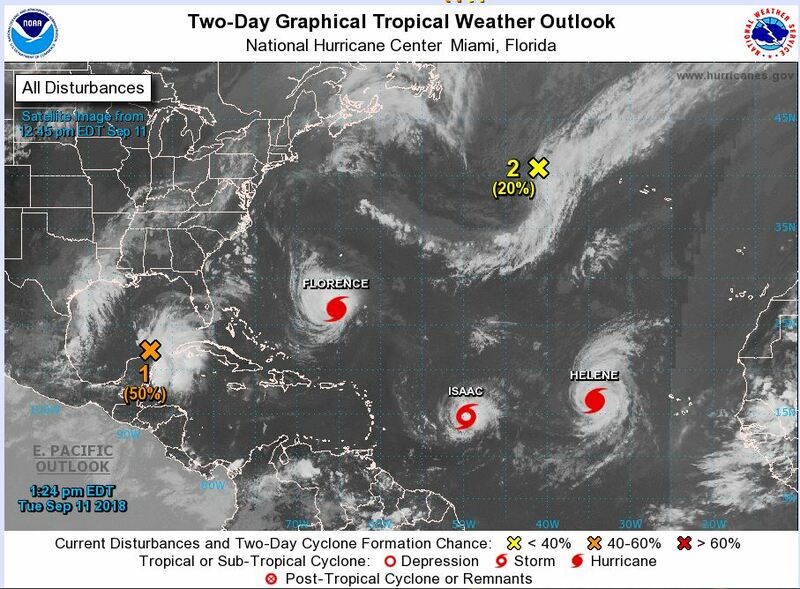 "That storm is so far out there that we just don't know whether it will make the turn and go more to the north to impact the Caribbean," said Jacob Meisel, Bespoke Weather Services chief weather analyst. A third storm was also being watched but it is as yet unformed and unlikely to strengthen to be more than a tropical storm. However, it appeared to be tracking north from the Yucatan toward Texas refining areas around Corpus Christi. "There are a few models that show it becoming a tropical storm, but nothing I see has it going beyond tropical storm," said Meisel. But Kloza said even threats of high wind could encourage refiners to shut down temporarily and that would have an impact on supply. "There will be some gusty winds and heavy rain along the Texas border, but whether it's even enough to impact refinery operations, we don't even know yet," said Meisel. Meisel said the still unnamed storm has a 70 percent chance of turning into a tropical depression within five days. "I think there's a general nervousness at how active the Atlantic basin is right now. There are five storms," said Kilduff. In North Carolina, meanwhile, there were some spot fuel shortages for motorists, but Kilduff said there are no reports of spiking gasoline prices. "Right now there's gasoline. That's plentiful. The only problem we've got is demand is so high we're having spot outages at stations that are running out of product because of demand. Then of course we have to get trucks back in and resupply those stations," said Gary Harris, executive director of the North Carolina Petroleum and Convenience Marketers Association. Consumers can get gasoline. "If they will be patient they will be able to get fuel. We don't have any problems at the pipeline, and we don't have any problems at the terminals. It's just a matter of demand exceeding supply," said Harris. Harris said many gas stations and wholesale bulk terminals have generator power, after the lessons of hurricanes Fran and Floyd. Unlike the New York and New Jersey area, which had severe shortages after Sandy, gas stations should be able to reopen even if the power is down. Harris' association represents 3,500 stations in North Carolina. He said he hears shortages are in the more populated area, including the Research Triangle.